Nejc Žnidarčič, 35-year-old Slovenian wildwater kayaker was one of the main favourites before Saturday’s ECA Wildwater Sprint Canoeing European Cup race in his home country. In a tough competition with all the best Slovenian paddlers on the start (the only one missing was 2017 European Champion Vid Debeljak), Žnidarčič produced the best time of the day to win the race in front of Tim Novak (SLO), who was 1.25 seconds behind, and Anže Urankar (SLO), who was third. 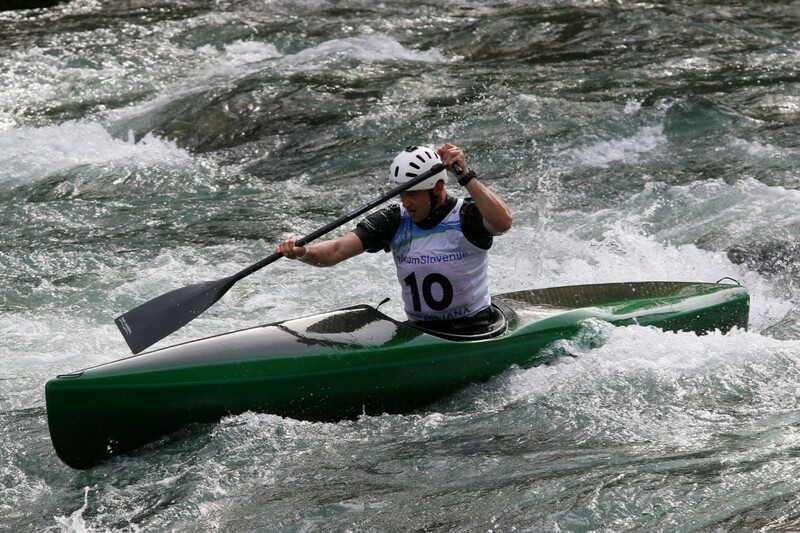 In men’s canoe Croatian paddler Ivan Tolić won the race in front of reigning World Champion in Wildwater sprint canoeing Blaž Cof from Slovenia. Only 0.20 seconds divided the best two canoeists of the day. Luka Obadić from Croatia was third. In men’s C2 Luka Obadić and Ivan Tolić paddled together to win the race in front of their teammates from Croatia Jadran Zonjić and Antonio Obadić. In women’s kayak Slovenian representative Lea Novak beat Valentina Dreier from Austria, while in women’s canoe Alba Zoe Gržin won the race. There were also races in junior category held on the Kolpa River. Slovenian kayakers Vid Oštrbenk and Urban Novak picked up first and second place in men’s K1 junior event, while Dušan Mačkić from Bosnia and Herzegovina finished third. Last year’s canoe slalom junior world champion and European vice-champion Eva Alina Hočevar (SLO) produced the fastest time in women’s junior kayak event. Živa Jančar was second and Helena Domajnko third (all from Slovenia). Eva Alina Hočevar also competed in canoe and produced better time than Gržin in senior C1W event. Young Slovenian canoeists Maj Oštrbenk, Nejc Gradišek and Martin Gale took all three podium positions. All three also competed in junior C2 event, where Nejc Gradišek and Martin Gale won the race in front of brothers Maj and Vid Oštrbenk. The next race in the 2019 ECA Wildwater Sprint Canoeing European Cup series will take place on 28th April in Augsburg, Germany. Current overall standings for the 2019 ECA Wildwater Sprint Canoeing European Cup series are available here, and standings for the 2019 ECA Junior Wildwater Canoeing European Cup series are available here.